In 2011, Information and Communication Technologies (ICT) accounted for around 7.7% of the total energy consumption and this figure is expected to increase to 8.1% in the global calculation by 2020. It is essential that energy efficiency measures are applied in order to counterbalance the expected growth in ICT. With an energy efficiency strategy, the ICT sector can save around 15% of global emissions in 2020. A huge effort was undertaken on Methodologies for Energy Consumption and Carbon Footprint of the ICT-sector, but the impact has proven a very low workability for the average smaller organisation, including SMEs. SMEs do not have the adequate time or resources to pursue this efficiently: methodologies do not provide in a simple form, the information and the resources to perform carbon footprint calculations. 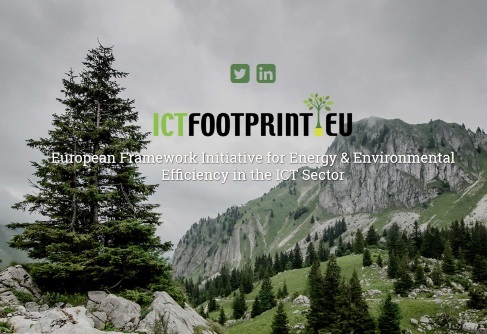 ICTFOOTPRINT.eu will address this aspect, by supporting the practical calculation of energy and carbon footprint in ICT (products & organisations), allowing easy access to methodologies that are internationally recognised and, contextually, help organisations to be efficient & reduce their carbon footprint. This will be done through a high-usability online platform, translated in 5 languages, providing: •	High quality tools to carbon footprint methodologies, which will guide end-users, to measure their ICT carbon footprint using standards procedures and metrics; •	A help desk, with high-standard response time, providing assistance to organisations interested in using the methodologies; •	A marketplace for energy & resource efficiency solutions; •	Webinars & communication materials; •	Best practices in adopting ICT footprint methodologies in Europe. The ICTFOOTPRINT.eu team brings together some of the best energy efficiency in ICT and methodologies experts from all around the world through an External Advisory Group. Trust-IT coordinates ICTFOOTPRINT.eu, designs a forward-looking policy action plan and ensures an effective stakeholder engagement. Trust-IT also leads the communication strategy, with the development of both ICTFOOTPTINT.eu web platform and mobile app, and leading the activities focused on exploitation & sustainability. Another central focus will be the design, adaption and implementation of a sustainable business plan. Feb 2016 to Jan 2019 ICTFOOTPRINT.eu has received funding from the European Commission’s Horizon 2020 research and innovation programme under the Grant Agreement no 690911.